I'm posting old family photographs from my collection on Wednesdays, but they won't be wordless posts like others do - I simply am incapable of having a wordless post. Isn't this a great picture? 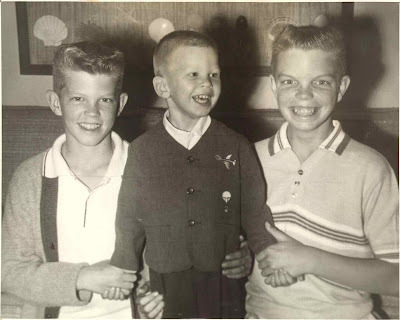 This is a picture of my brothers (Stan on the left, and Scott in the middle) and I (on the right) in about 1958 (dated by Scott's apparent age, he was probably 2 or 3 in this picture, and standing on the couch wile Stan and I were sitting). I think it was taken by my mother at the Lyle and Emily (Auble) Carringer house on Point Loma in San Diego, based on the wall decoration in back of the couch. Don't you love the hair? Stan had brown curly coarse hair, and was able to make a ducktail in front and back easily, although he only brought the hair in front down over his forehead in an "elephant's trunk" away from home. Scott had straight "sandy" thin hair, and had just had a haircut, I think. I still had straight light brown ("sandy") thin hair in a flat-top style at this time, and I used Butch Wax to hold the hair straight up on top of my head. We all had short hair on the sides in this picture. Look at the Smiles - Stan and I had probably been told to smile and look at the camera and we were good boys (hmmm, at least at Gram's house), and Scott was looking at somebody else (my father?) doing something goofy to make him laugh. This photograph was handed down from Betty Virginia (Carringer) Seaver (who married Fred Seaver) to me, their son. My brothers also have copies, and Stan gave Scott and I a framed 8 x 10 of it several years ago for Christmas. I know that this isn't Wordless Wednesday, but I wanted this to be a candidate for the Smile for the Camera carnival, although I probably have a better candidate for Crowning Glory. It's ok not to be wordless. I like hearing the stories behind your pictures.